The purpose of our trip to Santorini was to relax and soak in some sun. We knew we'd do a little exploring but we were also aware that this trip probably wouldn't be the cultural peak of our 2013 travels. 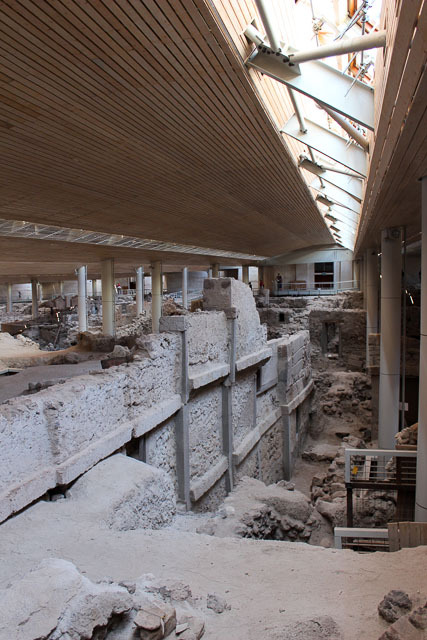 I was prepared to spend the majority of our time on the terrace, reading a book from a sun lounger but was quite excited when we stumbled upon Ancient Akrotiri while exploring the island. 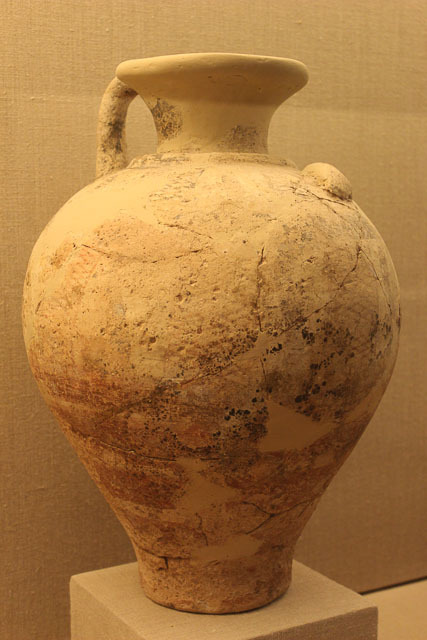 While they've traced settlements back to 4000 BCE, it was around 3000 BCE when a more substantial settlement was founded on Santorini Island. It continued to grow and essentially became one of the main hubs of the Aegean sea. At the end of the 17th century, a major volcanic eruption covered the entire settlement preserving the town below the new island surface for thousands of years. Speculation says the entire event may have been the inspiration for Plato's Atlantis. In the 1960s, the site was discovered and excavation began. The absence of human remains have lead researchers to believe that an evacuation must have happened before the volcanic eruption and the amazingly well-preserved site has been compared to Pompeii. It's stated that only 3% of the site has actually been excavated meaning that there will most certainly be more to see and learn in years to come. The city itself is quite literally, fascinating. 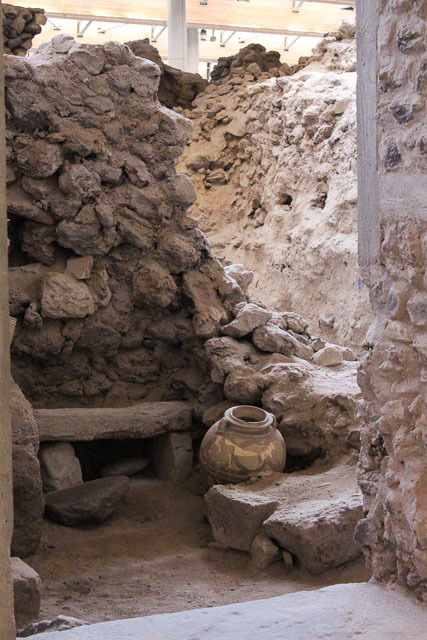 Multiple story homes, a pretty clear grid system, an advanced drainage system, pottery & furniture all provide insight into the ancient civilization. While it's a little difficult to see in the photos, it was quite clear onsite that this was a fully functioning and advanced city. I was amazed to see well preserved artifacts sitting in rooms like nothing had happened - designs and paintings still fairly evident. 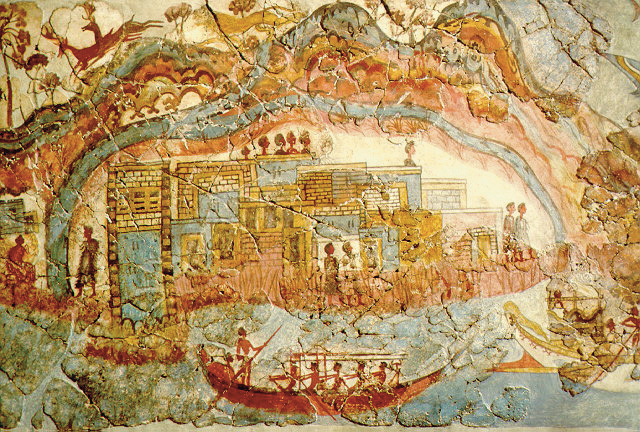 The majority of the smaller items have since been moved to a museum located right in Fira including enormous and elaborate wall paintings. 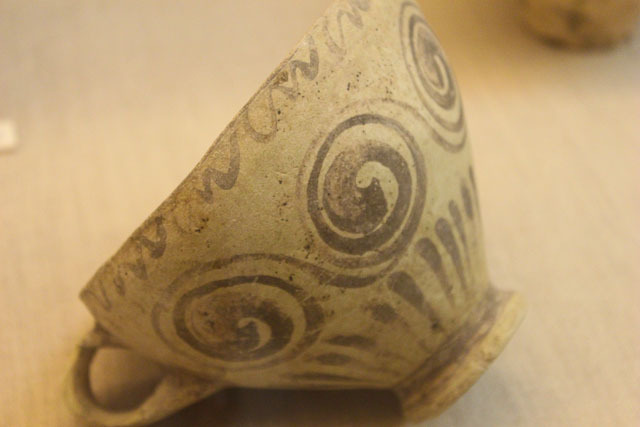 Tea cups and frying pans look almost exactly as they do today and dainty and intricate appliances survived the thousands of years below all of that sediment. It really was quite an amazing site to experience. 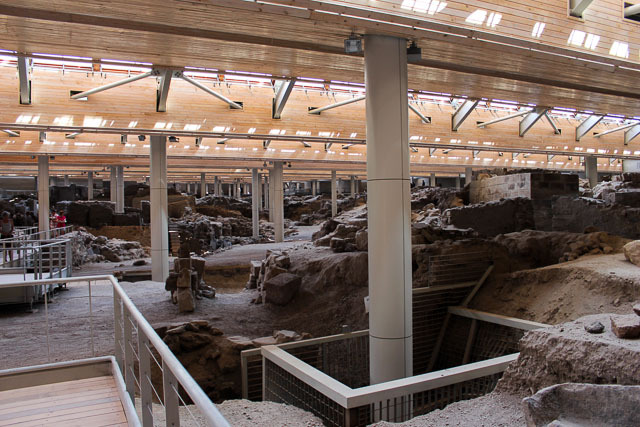 +The archaeological site of Ancient Akrotiri is located at Akrotiri near the Red Beach. The site costs 5€. The man at the gate didn't give us any information when we arrived and we had wished to either join a guided tour or at the very least, use the audio guide as signs inside are few and far between. 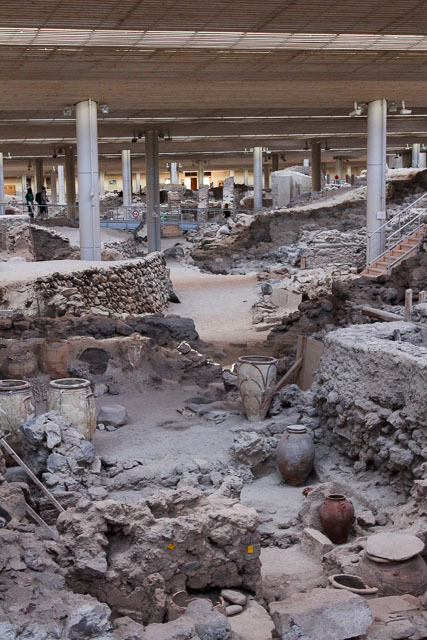 +The museum housing the majority of artifacts found at the site is located in Fira. The entrance fee is 3€ and can quite easily be done in 1-1.5 hours, reading at all of the exhibits. +All of the photos above are mine except the wall mural which was borrowed from Wikipedia. Thank you Caterina! I hope you get to experience it soon! Wow, how interesting! I'd love to visit and be able to see all of this - I love this kind of stuff! 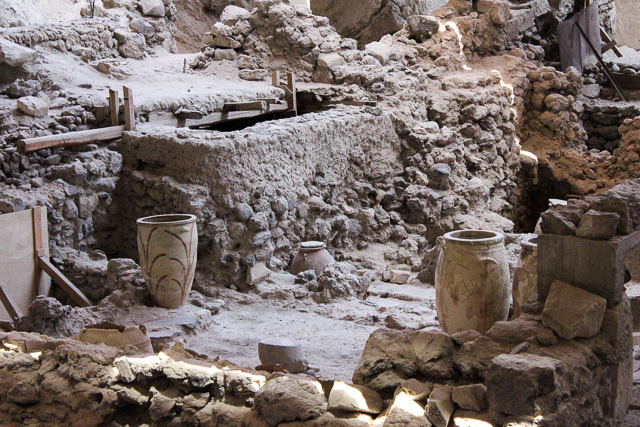 I had no idea that there was an archaeological site on Santorini - it makes sense, though, considering how many ruins there are on mainland Greece! It's fascinating that there probably was a mass evacuation... I wonder what it must have felt like for the people to be at the mercy of the volcano. Such an interesting post - thank you!